Mstislav Rostropovich's father was a concert cellist, his mother a professional pianist, and almost from infancy he was taking piano lessons. By age 8 he was an accomplished cellist, and at 12 he entered the prestigious Gnesin Institute of Musical Art. At 16 he enrolled at the still-more prestigious Moscow Conservatory, where his teachers included Sergei Prokofiev and Dmitri Shostakovich, and at 18 he won the Gold Medal in the Soviet Union's first nationwide music competition for young artists. After the 1973 death of Pablo Casals -- who had been his father's teacher -- Rostropovich was widely considered the world's finest cellist, and he used his celebrity to speak out for artistic freedom in the Soviet Union. He invited the banned novelist Alexander Solzhenitsyn to live in his dacha outside Moscow, and wrote to Premier Leonid Brezhnev demanding that cultural restrictions be lifted -- and made his letter public. He personally carried a manuscript for Solzhenitsyn's August 1914 to the Soviet Ministry of Culture, where he argued that the book was too brilliant to be suppressed. In response, Rostropovich's concerts were canceled, foreign tours were disallowed, and his name was forbidden to be mentioned in Soviet media. In 1974, amid international pressure, he was granted an exit visa, and for years he did not return to Russia. He led America's National Symphony Orchestra, carrying the baton for 17 years and gaining great acclaim as a conductor. In 1977, as Soviet officials tried to lure him to return, he stated publicly, "I will not utter one single lie in order to return. And once there, if I see new injustice, I will speak out four times more loudly than before." He was stripped of his Soviet citizenship in 1978, and lived for many years in Washington DC. In 1989, when the Berlin Wall fell, he flew to that city and led an impromptu celebratory concert. The next year, he was allowed to return to his native land, leading his American symphony on a tour of the USSR. 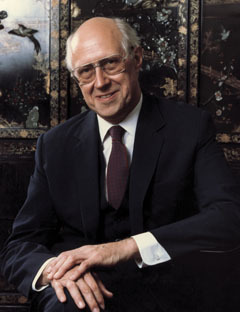 In 1991, as Soviet hard-liners plotted a coup against new Russian President Boris Yeltsin, Rostropovich rushed to Moscow, blustered his way past guards and into the barricaded parliament building, where, according to Yeltzin's later remarks, Rostropovich immediately armed himself with an assault rifle. Some of the world's most respected composers, including Leonard Bernstein, Benjamin Britten, and William Walton, wrote concertos specifically for Rostropovich. In his last years he sponsored a vaccination program for children in Russia and Eastern Europe. Grammy 1970 Best Classical Performance, "Brahms: Double Concerto"
Grammy 1983 Best Chamber Music Performance, "Brahms: Sonata for Cello and Piano in E Minor"